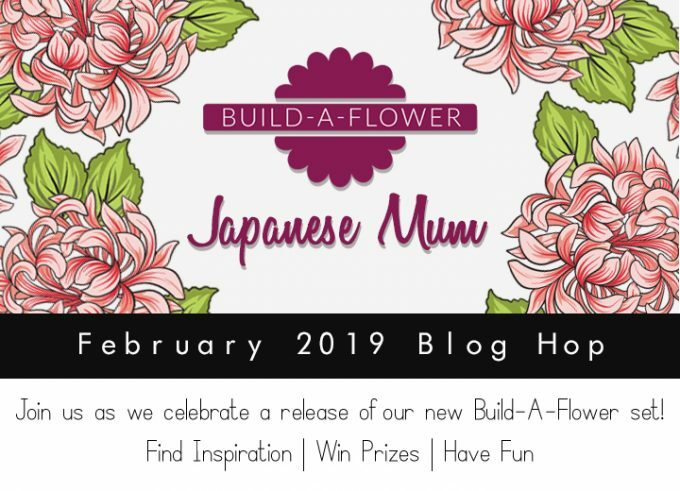 Hello and welcome to Altenew Build-A-Flower: Japanese Mum Release Blog Hop! 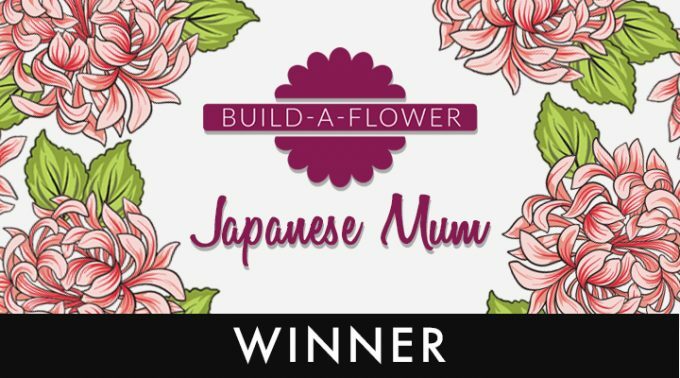 We’re celebrating the Build-A-Flower of February – Japanese Mum. You probably came from Emily Midgett. If not – you may consider starting from the beginning at Altenew blog and see what other members of Altenew design team and guest designers have created. There are so many beautiful projects from talented designers. Also you on each stop you you have a chance to win a prize. I made a one layer card using the new set. 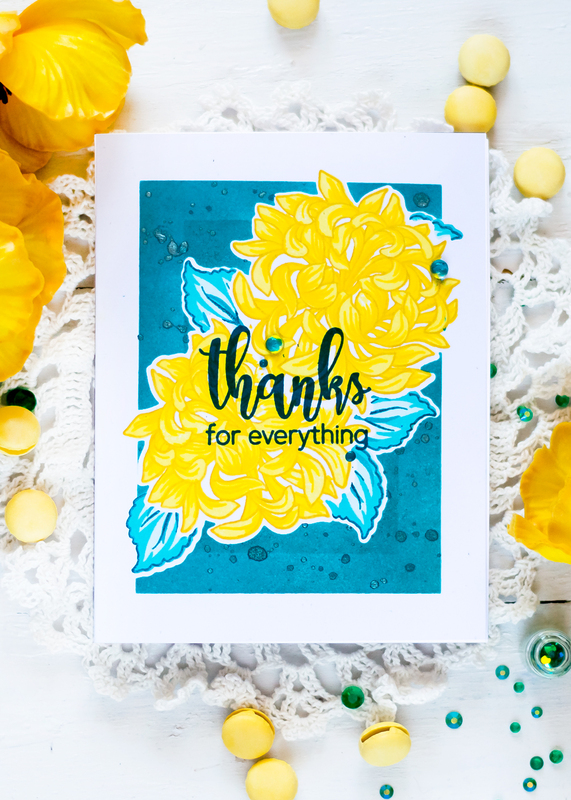 I stamped the flowers onto a white card base using yellow inks and leaves using teal inks. To mask off the overlapping elements I used masks which I die-cut out of a masking paper using the matching dies. You can see the white borders around the elements – they happened because die-cuts are bigger than corresponding stamped images. So the masks were bigger too. I took this approach with die-cutting masks not only to make my life easier (as I didn’t have to fussy cut them). After I stamped the flowers and leaves I taped the card base edges with a painters tape, leaving the flowers still masked, and blended Teal Cave Dye Ink onto the unmasked area. I was using an inch wide tape and taped that inch from each edge. Which left such little unmasked space in the middle. Which I ended up not liking. So I decided to increase that inked rectangle, this time taping down just 1/2″ inch from each side. That time I got the result I was going for. I wanted to have flowers onto an inked rectangle hanging out its edges a bit. You can see my previous smaller rectangle edges still visible. I wasn’t able to cover them completely. But I actually like the result. I think I want to repeat it one day with maybe even more layers of inking. I also added some splatters of the Lagoon Ink Spray before removing all masks and tape. So to finish off the card I stamped the sentiment in the middle and added several clear droplets as well as liquid drops. I will also randomly choose a winner from comments left on this post and the prize will be $20 gift certificate to Altenew online store. Please leave a comment on this post by 2/5/2019 at 11:59 PM EST for a chance to win. I will announce the winner here in this post on 2/6/2019. The winner of $20 Gift Certificate is Mindy Drummond. Gorgeous mums. I always think of mums in a yellow gold as you think of them in the late summer early fall. The teal and yellow colors are perfect together. Always enjoy your commentary as to why you do what you do on your cards. So pretty! I love the bright yellow flowers!! I never would have thought of using such a bright background — it works beautifully! Many thanks. Such a pretty card- love the yellows. And I had to laugh reading about your masking problem. It adds such depth to the background. A ‘happy’ mistake. Pretty card! The yellow and blue look great together. Who wouldn’t want to get such a happy & fun & bright card like yours in their mail? I know I would love it!! I always look forward to your artistic creativeness!! Thanks for sharing. What a great pop of color! I love the bright yellow with the blue. It’s stunning! Thank you so much for sharing your talent! Oh Svitlana, those yellows against the teal background just sing Spring. Gorgeous stamps and fabulous addition to the layered flower stamps. Love it. Stunning! Love the teal and yellow. So pretty! What a gorgeous card! I love the yellows in it! 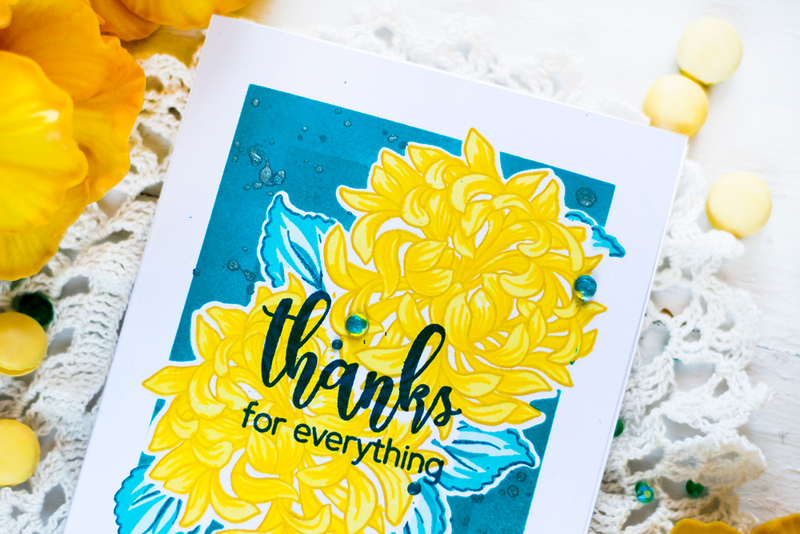 WOW – stunning card – I love that incredible contrast of that gorgeously intense blue background and the bright, bold, sunny yellow flowers. Just beautiful !!!! You always do such great work….I am a fan for sure. Thank you for sharing your pretty work. Great new release…I love this set….hugs! Wow!…. bright and beautiful, a nice contrast to where I am on this snowy, grey day. A great way to end this fun blog hop, too! So pretty, love your bold colors! Thanks for showing a bold way to use this new set! Svitlana, that gorgeous card just lights up a cold, wintry day. Thanks! Beautiful. Love the yellow and blue. Beautiful card so bright and cheery! Your card is very dramatic. I love the colors you chose. I always love your examples. Your colors are stunning. Not something I would have put together, but you made it work together so beautifully. Your card is stunning! The colors are so lively!! Yet another awesome card using yellow ink. I would never thought of trying such a light ink colour on this particular stamp set. But I guess I just have to learn to go out of my comfort zone once in a while. Thank you for sharing. Your card is absolutely gorgeous!! I love the colors you used. Love the all the differing looks these Build-A-flower sets can get! Thanks for the wonderful ideas. A bright & cheery card! Just when I think I have all the flower stamps I need…Altenew dies it again. Amazingly real and I love the sentiments and fonts! Great job with it, Svitlana! 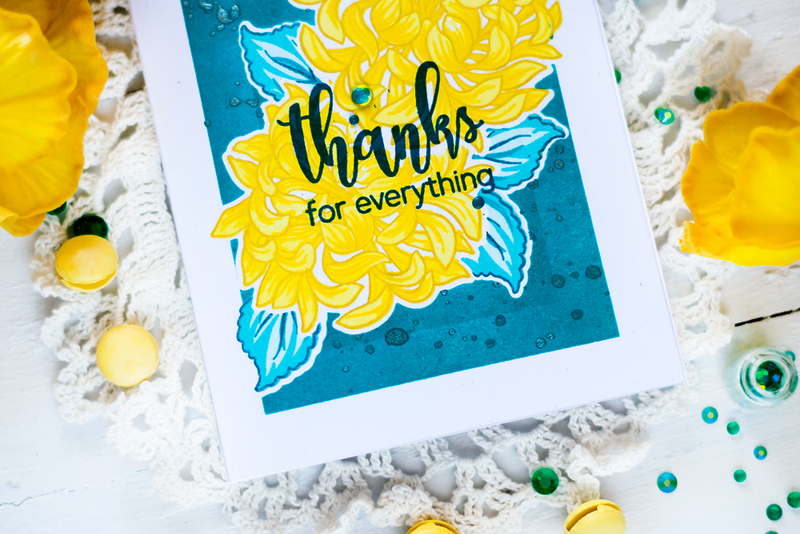 Great job, love the way the yellow flowers pop on the teal background. Thanks for sharing. Wonderful colour combination on this pretty card. Haven’t used these together yet but need to as they look so stunning. I like the fact that you can still just see the smaller rectangle too, fun look. Thank you for rounding off a fabulous hop. Love the color combination – awesome! Your color combination is stunning! Gorgeous! Teal & yellow are perfect combination for the beautiful Japanese Mum stamps! Beautiful! Thank you for the fun! Such a gorgeous card! Love this new BAF set. Wow… what a gorgeous card! 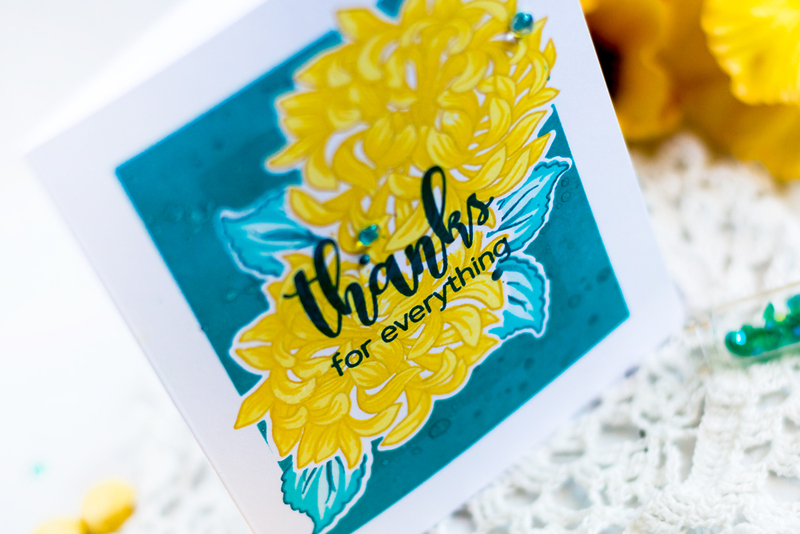 Love that color combo and these lovely blooms from the newest BAF set! Thanks for sharing your bright and cheerful card. The blue background makes the yellow mums pop. Love this gorgeous BAF set! Your card is breathtaking Svitlana, the color combo is stunning, absolutely love it! Thanks for the inspiration! I love the bold impact of your card! I love the yellow and blue combination you used to create your masterpiece. The yellow Japanese Mums jump right off the card! Thanks for the inspiration. Stunning Color combination! Love your bright and cheery yellow flowers and the BG! Absolutely fascinating! A super bright, happy card, Svitlana! Your colour choices certainly help to make your flowers ‘pop’! Thanks so much for sharing as well as the great inspiration! You always use such unique color combinations. This one is stunning. I like the white border around the flowers and leaves. The background with the splatters is great. Awesome card! Such a great idea for color on beautiful card. Thank you. The bright beautiful yellow of this card is crying for warmer days. Thank you for sharing your techniques with us! I really like the brightness of this card & the yellows & blues go together so well. As it turns out your “mistake” on the background adds depth & almost makes it look like it isn’t a one layer card. I’ll look forward to seeing the next card you make purposely doing this. Thanks! what a fun bright cheery card, Svitlana! love it!! Love the blue and yellow. Very dynamic! Thanks for sharing! What a nice pairing of colors for your card. Oh, what an ending, Svitlana! Way to go out with a bang! I am totally LOVING your colors…..the yellows against the blues, with the white base, are so eye-catching. And I do love one layer cards! And I think your ‘mistake’ gives a nice shadow effect to your borders! I love this stamp set. Especially the bold sentiments! Thanks for some expert inspiration here today! What a beautiful card! 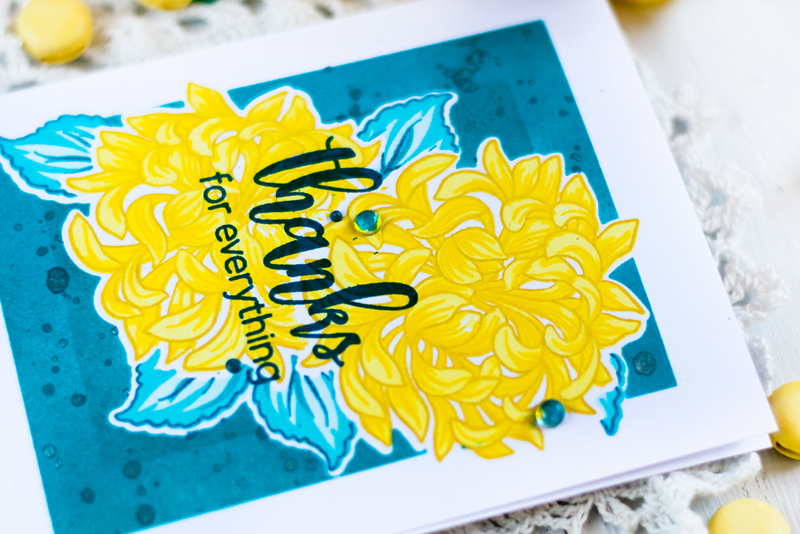 The teal background really makes the yellow flowers pop right off the card! Thanks for the inspiration! Such a pretty color scheme, Svitlana. I love how the yellow is so vibrant against the teal background. This is a gorgeous new build a flower stamp set! The perfect colors for this flower! Such a beautiful card! Love the vibrant colors. Such a bright and sunny card!! I love the brilliance of the yellow against the teal. It’s a very happy card!! What a great color combo! I love the bright yellow! STUNNING! Beautiful card! 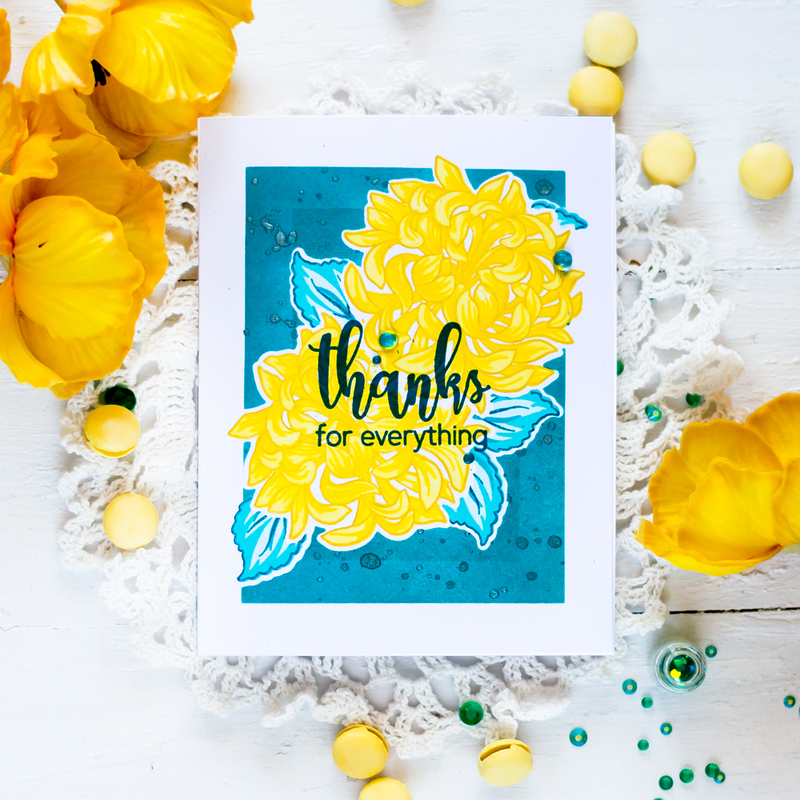 I love the yellow flower with the teal background – the flower is highlighted beautifully! Wow! Gorgeous card! I love the bright, beautiful colors. The flowers just pop off the blue background! These colors are bold and bright! I love it when you go full Ukrainian flag on your cards. It reminds me what a fabulous color combo they are. Thanks for sharing with us! I like the white outline against the teal background, it acts line a “shadow” and helps to add depth to the card. Until you mentioned that it was one layer, I thought you had popped it up. Beautiful and fun as always. Beautiful rich colors! I like that you can see the original background. It looks like a frame, although to be honest, I’m not sure I would have seen it if you hadn’t mentioned it. Thanks for sharing! I love your vibrant colors. This is such a gorgeous stamp set and your card is beautiful. When I see your name listed on a blog hop, I always look forward to seeing your work. I like how you had tips of the flower/leaves go beyond the colored background and the sprayed drops add depth/richness to the card. Great work!!! A stunning card and I love the beautiful colours you used. Great work! Your card is beautiful and I love the teal leaves! I think your ink blending around the flower looks amazing, I can see the original smaller ink blend too and it looks like you meant to do it, it really does look fantastic! Bold, vibrant and absolutely amazing card! Such great color combination! I love this flower set, it’s got to be my favorite BAF so far! It’s definitely a must have for my crafty stash! Oooooh, I love the teal & yellow! So beautiful! Great shade of yellow. Awesome. Fantastic card! Love the bright yellow flowers in comparison to the deep background. Your cards are always so beautiful! This one is so amazing I love the double border. What a great technique! Also, the colors you chose are perfect. This stamp looks so great in yellow. Yellow is my favorite color and I absolutely love your bright and cheery mums!!! Thanks so much for sharing how you created your one layer masterpiece – so much detail, yet super easy to mail!!! Wow! This card is just gorgeous Svitlana. The color combination makes me so excited for spring. Thank you for sharing your work with us. Beautiful as alqays.